Washington State Patrol says both escaped inmates from Washington State Hospital are now in custody. LAKEWOOD, Wash -- The search for a dangerous man who escaped from Western State Hospital Wednesday night has moved to Spokane. Authorities say Anthony Garver, 28, arrived in Spokane around 5 a.m. Thursday after he bought a bus ticket in Seattle Wednesday night. Sheriff's deputies say he showed up at his parents' house in Spokane Valley in the afternoon, then ran off. Garver's mother reportedly called 911 when she saw him. The Spokane County Sheriff's Office says deputies are working with U.S. marshals and others to find Garver. They plan to continue their manhunt through the night after a search with police dogs, helicopters and a SWAT team near the home turned up empty. Police captured another escapee, Mark Alexander Adams, Thursday morning. Anthony Garver and Mark Alexander Adams were seen at the dining hall at Western State Hospital at approximately 6 p.m. and discovered missing at 6:45 p.m, the Department of Social and Health Services said. The men were housed in the locked civil ward at the hospital and escaped out a window that is normally locked. DSHS is speculating the bolts on the window may have been tampered with over several months. Adams was captured without incident in Des Moines Thursday morning. Lakewood police Lt. Chris Lawler said Adams was recognized from media coverage, helping lead to the capture. Lakewood police believe Garver purchased a ticket at the Greyhound Bus in Seattle for Spokane Wednesday night. Police released surveillance photos of him at the ticket counter buying a ticket with cash under the name of "John Anderson." Garver has a criminal history in Spokane. Authorities there call him a domestic terrorist after he planned to bomb Riverside Park and a government building. “Garver is the more serious offender, and he’s the one we consider to be scary and dangerous,” said Lawler. He said anyone who sees him should not approach him, but to call 911 immediately. 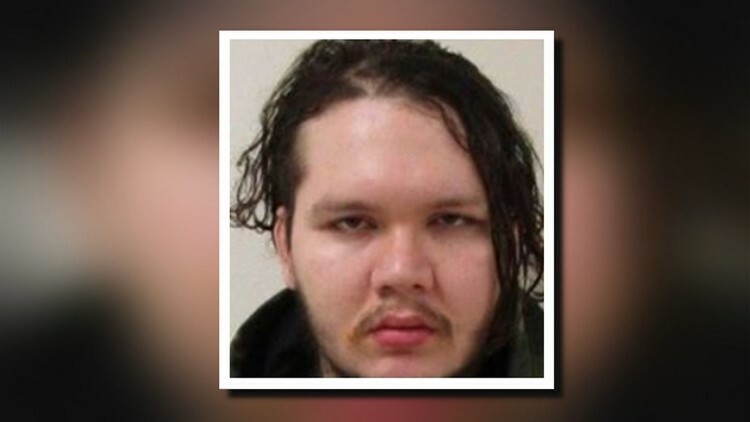 Garver is 28-years-old and stands 5 feet 8 inches tall and weighs 250 pounds with long curly brown hair and a beard. He was last seen wearing a brown sweatshirt and orange flip flops. Garver was arrested in connection with the murder of 20-year-old Phillipa Evans-Lopez in Lake Stevens in June 2013 but was found not competent to stand trial. Court papers say Evans-Lopez didn't know Garver but surveillance video showed the two together at a restaurant. Her body was found a few days later, stabbed 24 times. Adams was sent to the hospital after he was found not competent to stand trial for a 2014 domestic violence charge. Both men were at the hospital on an 180-day court commit out of Snohomish County to treat mental illness and arrived at the hospital in February. The men came to Western State Hospital in February 2015 and shared a room together, Lawler said. Police believe the men left together on foot and got on a Pierce County Transit Bus. According to Lawler, a bus driver thinks he picked up Garver outside the hospital around 6 p.m. and took him toward the Lakewood Towne Center, but could not say where Garver got off the bus. The driver thinks he picked up Adams at the Steilacoom ferry dock and took him to the Lakewood Towne Center. Surveillance photos confirm Adams then took a bus to the Federal Way Transit Center and arrived at 10:30 p.m. He asked how to get to Sea-Tac Airport. Lawler said police are trying to obtain surveillance video from Pierce Transit to confirm when the men were on the bus and to determine what they were last seen wearing. "The hospital is undergoing a complete safety review and plan to bring in outside experts to go through our facility," said Carla Reyes, assistant director DSHS Behavioral Health Administration, said in a statement.